A new year is beginning - and it promises to be another great one! Our programs are scheduled, our projects continue, and we continue to make an impact at the local level and beyond! It is really a pleasure to work with ladies who see a need and volunteer to fulfill it! That is what this tent is all about!! I didn't expect to be President for a second term, but knowing that I have a great team to work with me, made the decision to say, "yes" easier. Again this year we are trying to keep communication open, to make our tent the best in the Department. Check our Facebook page often for updates and announcements. Watch for the Bugle (the weekend before a meeting) and minutes to arrive in your inbox. And if you have an announcement that you think will be of benefit to our members, be sure to share it! We have only a few more books to send out to high schools. A site has been found for a historical marker. We will be sharing GAR scholarship information with our college students. And we will have a great time in Kansas City June 7 & 8 for our 2019 Department convention! Click HERE or on the book cover image for more information and an order blank or to pay with PayPal. 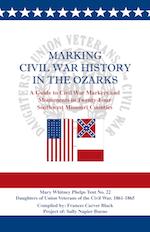 Download additional page to include the Orphans' Home marker which was placed after the book was printed.